Oh. My. God. Just look at this Russian Beauty. 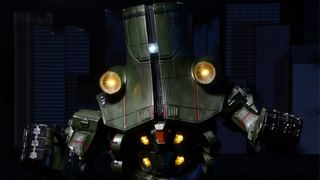 Neca's Pacific Rim line continues to delight Jaeger lovers like me with a new, 18-inch tall rendition of Cherno Alpha (aka secret best Jaeger of the movie). It's... it's wonderful. Like Gipsy Danger before her, Cherno is beast of a figure at more than twice the size of NECA's usual scale for Pacific Rim toys, but is still packed with lots of articulation just like her smaller-sized toy (please please please let there still be hydraulic fists like the other figure) - and working LEDs so you can blind everything else on your desk/also yourself with the Jaeger's mahoosive lights. But just look how lovely it looks! Cherno might have been my favourite design from Pacific Rim so I'm slightly bias here, but what a wonderful, wonderful robot design. It looks lovely all lit up in low lighting too (just like basically all the action sequences in the film itself!). Cherno will set you back a lofty $100, but it's $100 of Russian Mech goodness. And even better, according to NECA it's shipping this week!